This photo was taken on September 20, 2014 at 5:20 PM. The "Take It!" Talk about one that almost got away! I had walked into this hotel with a focused mind and walked right past these randomly located rose petals. On my way out I just happened to look downward and saw them. Even at that - I continued walking on my way back to get into my car. I had only gone a few steps beyond the petals when something in my mind told me to go back and take another look. I am so glad that this voice resides in my head and through the years I have learned to listen to it. 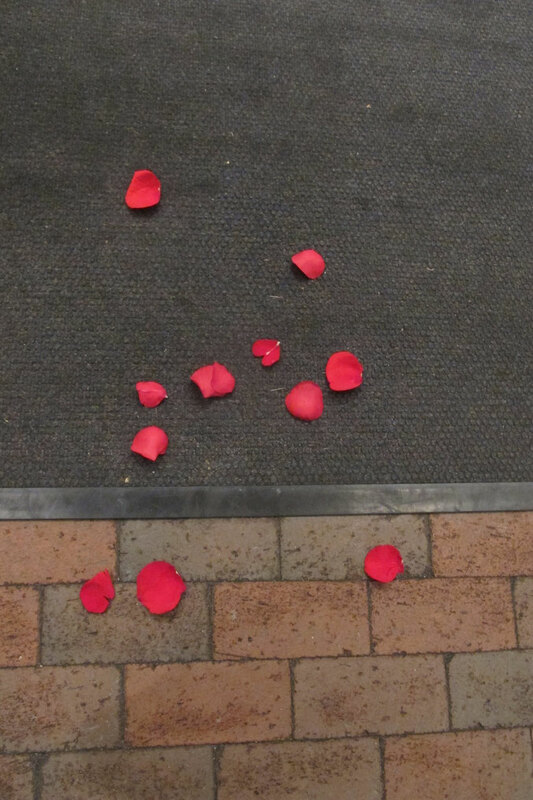 The After Take: In not much time - I had imagined a song being written about rose petals at someone's door step as a song. The style of music really would not matter - as I think there are a number of directions this music could take. I do not play any musical instruments and do not sing ( even in the shower - lol ) so rely on enjoying the voices and music made by others. If I may say so, I think this photo would also make a very nice stand alone. Here is hoping something happens your way that you think might also be the foundation for a song, either a new one or one that already exists. Were there romantic candles strategically placed all over the place? Awwwww how cute!!! I can only imagine the look on her face. My wife goes gaga for stuff like this. It can only get you out of the dog house so many times though.